The Ford Mustang celebrates its 50th anniversary this year and OPI is honouring this momentous occasion with a brand new limited edition collection! 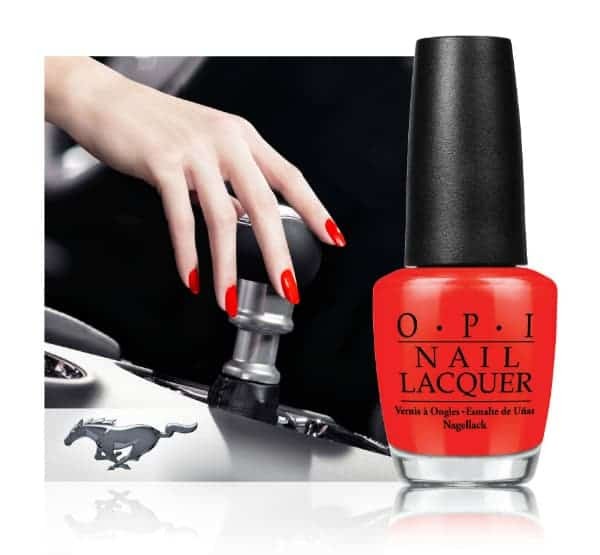 Ford Mustang by OPI features six new nail lacquers in a sophisticated palette of red, gold, black, pink, white and aqua, all colours inspired by this classic car. I can see myself driving a pink Ford Mustang right now. What about you? The colour of your car and your nail colour have something in common. They represent your style and personality. OPI’s Co-Founder & Executive VP, Suzi Weiss-Fischmann invites fans to accentuate their personal style and embrace their adventurous spirit through colour. Angel with a Leadfoot: Drive on up and say “hello” to this celestial white. The inspiration for these colours are all directly related to the Ford Mustang. Check out my review for the inspiration behind each colour as well as my personal favourite from the collection. You’ll be able to pick up the Ford Mustang by OPI collection at professional salons and spas beginning in July 2014. They have a SRP of $11.50 each. Which shade are you most looking forward to trying this summer? The Sky’s My Limit is gorgeous! The Sky’s My Limit is pretty gorgeous! I love them all though!